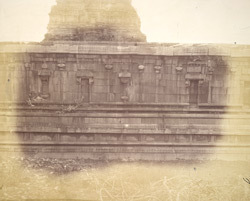 Photograph of the exterior side wall of the Pattabhirama Temple, near Kamalapuram, Vijayanagara, from the Archaeological Survey of India Collections, c.1880. The 16th century Pattabhirama Temple complex, dedicated to Rama, is situated on the outskirts of Vijayanagara. It is enclosed by a high rectangular wall entered through pyramidal gateways with diminishing storeys. It consists of a shrine with a vestibule and two pillared halls, all set within a very large rectangular court. The outer walls are decorated with pilasters and niches which have now lost their sculptures.